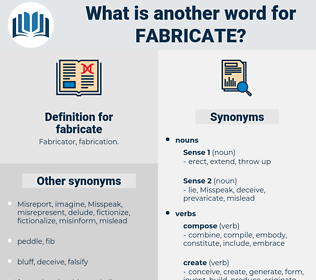 What is another word for fabricate? makes up off the top head. 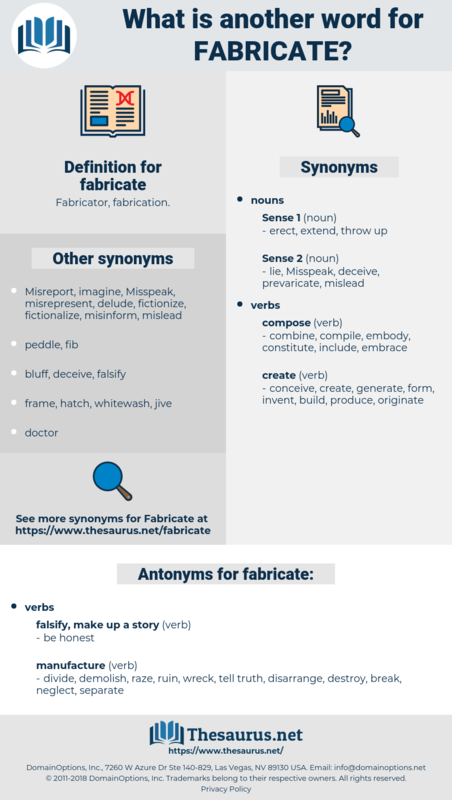 manufacture, Manufacturing, invent, create, build, construct, devise, generate, forge, make, compile. divide, demolish, raze, ruin, wreck, tell truth, disarrange, destroy, break, neglect, separate. copy, copycat, replicate, take down, eradicate, blow up, Ruinate, reduplicate, annihilate, clone, level, flatten, disconnect, explode, tear down, duplicate, mimic, disunite, disjoin, knock-down, devastate, authenticate, abolish, testify, extinguish, substantiate, verify, confirm, disengage, exterminate, pulverize, strike, pull down, take apart, swear, Demount, imitate, reproduce, validate, disassemble, smash, shatter, detach, dismember, assert, dismantle. And they fabricate that the Mass has been so called from mzbh, an altar. fire code, frosty, freeze out, forestay, foreshadow, frost, frock coat, forest, forget, fibrosity, forseti, ferocity, foresighted, far-right, frigid, forested, fur coat, febricity, force-out, forecast, forked, free-associate, fright, frigidity, fregatidae, fresh-cut, freak out, for good, forced, furcate, farragut, freight, freshet, free weight, frostweed, frigate, fork out, force out, fregata, fabricated, fraught, frosted, fireside, frowsty, frost-weed, ferric oxide, first aid, foresight, forsythia, farsighted, four-sided, first, far east, forged, free state.